Hello friends! I may not be able to post something new this week. We are in the midst of preparations for CommWorld 05 which will transpire on June 2-5. Our principal, Concerto Software is a Platinum Sponsor, and our organization is helping out in logistics and manning the booth. Do drop by CommWorld if you have time. This is an ICT event. Venue and trade show hall details are below. Thanks and til next week! What do you do when you're in the office, it's raining cats and dogs, and there's a midnight sale in Glorietta? Well, I was planning to bloghop while sitting out the rain but my colleagues had other plans. So off we hitchhiked to Glorietta. The girls (Gen and Dessa) went off to do their shopping, while Francis and I went in the other direction. Not that I had planned any shopping last night. In fact I did not have sufficient funds to constitute substantial purchases, sale or no sale. Sarah joined us after a couple of hours. We had a late dinner, then continued looking for good items on sale. I was eventually able to purchase three DVDs (Star Wars Episode 1, Coyote Ugly, and I, Robot) for 950 pesos total, while Francis bought clothing from Mossimo and shoes from Mendrez. I also bought this ice cream cup (which tasted like ice candy) with the Star Wars promotional item inside. I got a nice Obi Wan pencil topper. (By the way, if you're buying Purefoods hotdogs for the Star Wars toys, think twice. I felt ripped-off. The lightsabers use balloons for the blade which starts deflating the moment you blow air in, and the artoo water bomb's two halves are not proportionately made. See photo at left). When we made our final stop at the shoe shop, that was when I remembered why I did not like going to mall sales. I'm not really fond of the hustle and bustle and the long walks to the different shops. We walked for around 5 hours (I felt like I did my exercise that could last me the whole week!) and I was rearing to go home after we completed our purchase. I'm the kind that shops when necessary, browse at what's available (sometimes just scanning the racks and shelves will do then I move on), and when I find something I like, I buy it. I drove off for the office yesterday morning without a hitch. Upon arriving at the parking lot, I checked to make sure all doors were closed after the alarm beeped to announce it has secured everything. Then off I went for the office. At 8PM, I was finally trudging back to the parking lot while talking to one of our principals on the phone for event preparations. The parking lot attendant waved to me. Something was wrong. My rear brake lights were on for the entire day! Uh oh. The battery must have been discharged. I tried to disengage the alarm remotely. No beep. Uh oh. I had to cut my phone call short when my caller inquired why he was hearing a car alarm beeping incessantly when I manually turned on Blackie (the car's name). As I was pondering what to do next (I just drive; I know nothing about troubleshooting), the owner of the car next to me arrived. He inquired what happened and immediately offered to help. He suggested making a series connection with his battery to resuscitate mine, and promptly took out the necessary cabling. He was discussing about my options and patiently explained the probable causes. I decided to call upon Francis as well (a good friend and colleague) in case he might be able to help. He was on his way to a basketball game but said he'll be right over. A few minutes later, he arrived. I thanked the stranger for his trouble; he left the cable with us and requested the parking lot attendant to keep it after we're done with it. To make the long story short, Francis successfully got Blackie running again, then he promptly left after making sure I will be fine. He advised keeping the engine running in half an hour to ensure that the battery gets re-charged sufficiently for the ride back home. While waiting, the attendant shared stories and kept me company. I arrived home safely and promptly disconnected my battery, as the rear brake lights were still apparently on short-circuit mode. It was an unfortunate incident, but at the same time I feel blessed for being at the receiving end of the kindness of strangers and friends. I'd like to thank the parking lot attendant (whose name I forgot to ask), Aries of Boehringer, and Francis Carigma. Pay it forward! 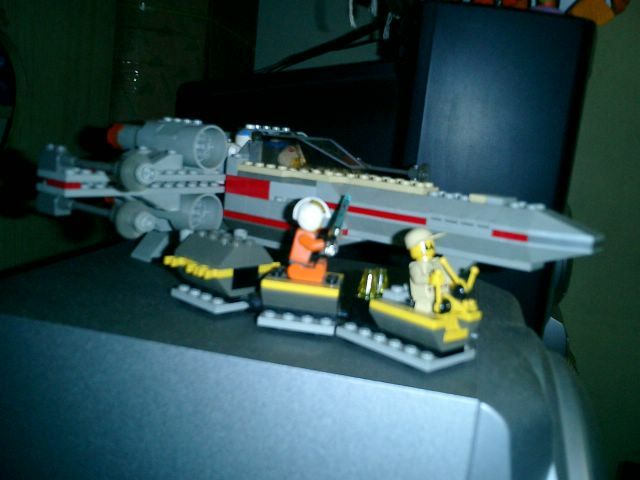 It's Star Wars Week in this blog! And here's some historical facts on some starwarsy days in my life. 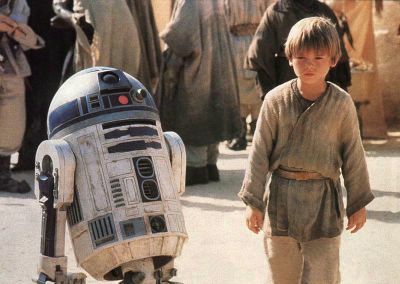 I was in grade school when Episode 4 (a New Hope) was first shown. I remember our school had a day dedicated for Milo promotional activities, and part of giving chocolate drinks to us was also the handing-out of Star Wars and Charlie's Angels trading cards. Of course I settled for the former. I have quite a number of toys and memorabilia, but many of them were not simply purchases. Here are some of their stories. In 1993, before the Special Editions were being made, I was in frantic search for Episodes 4 thru 6. I was able to get my VHS copies in Greenhills. A year later, I was given a chance to make a business trip to the US for 2 weeks. We were fortunate to have a couple of days extra, and we used one day in Disneyland Anaheim! That is one of the most unforgettable moments of my life. I had a grand time, especially when we took the Star Tours Ride! And I bought a Star Wars Return of the Jedi poster there, as well as a limited edition ChromeArt of Artoo and Threepio (see photo at left). 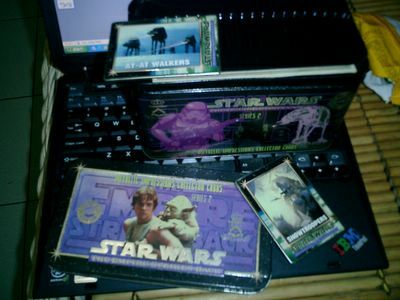 I was also able to buy the Star Wars original versions VHS in Toys R Us (Lucasfilm released these prior to the showing of the Special Editions). Also during this year, I became interested in scale model painting (mostly resins). 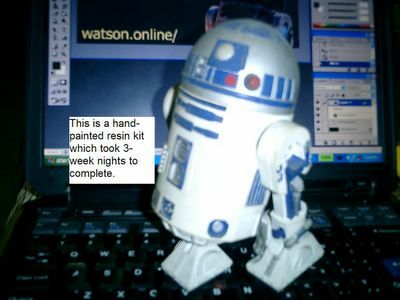 My first kit was that of a Tie Fighter, which was followed by R2D2 (see photo on top of this post). I was in the middle of making an X-Wing but stopped midway and has been kept in my cabinet that way. When the Special Editions were shown, Pizza Hut ran a promo stint featuring large tumblers with the top-half featuring a character. Wish I got more than one set; the Threepio tumbler's damaged. But I knew then that subsequent Star Wars showings will become hunts for toy tie-ins and merchandize purchases. For Episode 1, a friend named Francis Ibanez collected all KFC toys, bucket, and tumblers and gave them to me. I don't know what made him do it (he also gave me a couple of original Transformers casettes); perhaps it's the show of generosity between fellow fans. My former boss Sir Renan (he now heads another department), knew how big a fan I was of Star Wars. So when he comes back from a business trip abroad, he'd buy me the transparent version of the vehicles as a present. I think he was able to give me 4 different kinds. 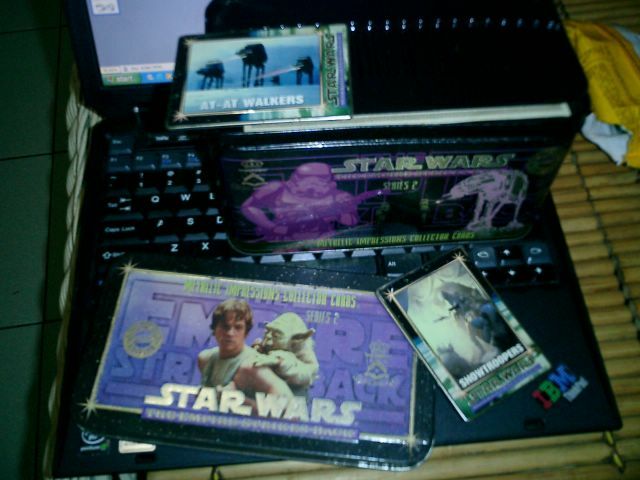 And then David (Claville's husband) gave me some old Star Wars toys in the late 90s. I was surprised when he also gave me a set of Metallic Impressions Card (see below)! And then Claville (who is now in Australia gave me a boxed set of Star Wars DVD for my birthday last year. My latest toy search at the height of Episode III's popularity has yielded four figures from Jollibee and a poster from M&M. Pauline has also bought a lightsaber for me (one that can change color between blue and red, and is obviously Anakin's. Pauline and Anthony also has lightsabers). I want those toys from Purefoods Tender Juicy Hotdogs but cannot seem to get my hands on any. Indulge me in this simple pleasure; it's the last episode after all, and it's an exciting time for me when a Star Wars film is showing. one showing at the movies. Episode III is both happy and sad news, in that the series is finally complete, but ultimately there will no longer be a subsequent release. I have read and watched many things about Star Wars, mostly off the Internet. I would like to share some of these which I remember to you. George Lucas coined the term "used technology". While other science fiction movies make their structures, weapons and ships look brand spanking new like they have just come off the assembly line, George Lucas made the Star Wars environment look like they've been there for the longest time. Signs of wear and tear in the ships and the helmets, partially-rusted weapons, gadgets bearing scars of prolonged use. Though usually included in the "Science Fiction" genre, Star Wars actually sits more comfortably with Science Fantasy due to its heavy involvement with a mystic power called the Force. The Star Wars saga is three trilogies long. But Episode 7, 8, and 9 will no longer be seen by public eyes as Mr. Lucas will spend most of his time with his family after Episode III is done. However, expect some work still to be done with Episodes 4, 5 and 6 as George Lucas takes advantage of current technology to shape these movies to his vision. He has re-worked some sections and released the Special Edition to movies before Episode 1 was shown, but he still plans additional work on them. When he was a fledgeling director, he decide to go with Episode 4 because he thought it was the most lucrative part business-wise, and the plot was quite straightforward. In a story off the Net, Han Solo was in military service under the Empire (in Episode 4, we learn that aspiring youths sign up with the Empire for military service, but Luke was requested by Uncle Owen to help in the harvest for another season when his friends have left). The wookies were eventually enslaved during his time. He saw Chewbacca being tortured mercilessly. Han Solo took pity on the wookie and rescued him, but he killed a soldier in the process. He then took flight with Chewbacca, who then had a life debt with Han Solo. They later on became smugglers. We first got to know Yoda in Empire Strikes Back as he stayed in Dagobah. Story has it that Yoda flew off to Dagobah, but he was detected by a Sith Lord and they fought in that planet. The Sith Lord was killed, but his dark aura remained in the planet. Yoda stayed in the planet, the dark aura neutralizing any detectable trace of the Force Yoda was emanating. There's no explanation for General Kenobi though, as he stayed in Tatooine undetected by the enemy. After Episode 6 (Return of the Jedi), it is said that Han Solo and Leia will have three kids. Two are twins (Jacen and Jaina), and will ultimately become powerful Jedis themselves. Luke moves on to establish the Jedi Academy. I was out of the country last weekend (I went to Baguio) on official business and arrived here in Manila last Wednesday. I'll post photos and some stories when I get settled at work in the office. Got lots to do right now. Until then, see you at the Star Wars screening! Yay! This is one of the very few times in a year that I see blood. It's our annual medical check-up, and the blood test is the squirmiest part. As I sat there, my stomach did flip-flops, and I couldn't help it but thump my left foot as I looked away. Then "click!" went the needle and after a while I moved on to the next test, a swab of cotton pressed onto the tip of my left ring finger. I'm so not looking forward to this next year. My wife and I found something nice to do before we go to sleep. We found the magic of the AM Radio (which I talked about in my other blog. Previously, we'd scan for stations that showcased classic Filipino songs, sung or hummed to the tune, then call it a night. Recently, however, we found another delightful source of ... ummm ... fun. There's this program called Dr. Love at DZMM. It starts from 10:15PM til 12MN, Monday thru Friday. It's free love consultation on-air. - a girl who has two boyfriends; one in the city, one in the province. She doesn't know what to do; who will she choose! - another girl has a visitor then in comes her boyfriend in the middle of the night and makes a show of himself with rude behavior. What is she to do? - a mother has a daughter who has been influenced with bad company and now goes home just to pack food (grocery shopping?) and stays elsewhere. Oh what to do?! - a guy calls in and says his girlfriend left for the province, and he knows she has a boyfriend there too, and she hasn't returned his calls for months now. He's so confused. Aaaarrgh! So while Dr. Love dishes out his advice, we spat out a piece of our mind, like we were part of the show host. We'd make pretty good advisers, but it will be of the insane, wacky kind! The kind that the character Amanda plays at the Amanda Show in Nickelodeon where she answers mail asking for advice. It may sound nasty, but we can imagine the host rolling his eyes at some of the dilemmas his callers dump on the studio floor. But don't take my word for it; listen to Dr. Love tonight! Quote for the day: "It's funny until it happens to you. When it does, call Dr. Love." 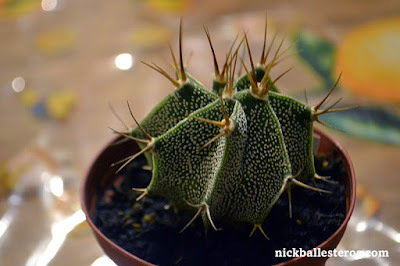 I have a new post in blogkadahan.com! The title is "Bad Fashion and Great Music". The rest is written mostly in Filipino, though. With that title, I'm referring to the unforgettable 80s, a time when I was in high school and life was so much easier and fun! And the clothes! The more contrasting the colors, the better. And with glittered gel and metallic buttons to boot! The 80s fashion may never see a revival, but the songs from that time certainly has a enduring appeal to it. In fact, I regularly hear these in radio stations, in bars, and even bands play them. Today's generation has even learned these songs and can sing to the tune. It's truly timeless. I'm sure they would have also loved wearing the funky clothes we wore. Or maybe not. In blogkadahan, I share a snippet of my high school life, and how these songs still remind me of those happy times so long ago. And when you're done there, do visit my post on Spirit of the Glass in my other blog, which also happened during high school. Happy bloghopping! It was quite hilarious, when I think about it. When we did our field trip last week, we were able to drill down our choice vacation spots to two: White Rock in Subic and Caliraya in Laguna. 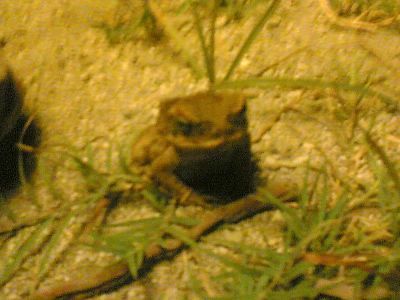 However, these two places also abound with creatures feared by my otherwise-brave and daring companion - frogs! We were walking along the grass-carpeted grounds of White Rock when Chu suddenly stepped back and pointed warily at something on the ground. A frog! O horror of horrors! I thought I'd have some fun with him at Caliraya. I pretended to pick up something from the grassy ground and ran towards him. Realizing what it might be, he told me he'd punch me right there and then. It was hilarious. Still, when we get to stay in either of these places, I was thinking of buying plastic frogs and place it on his bed for a morning surprise. Tee hee! Well, I also learned that some of my officemates are also "allergic" to these things. I'm not really a prankster, so if Chu happens to read this, don't worry. :-) I practically grew up with tadpoles, frogs, and dragonflies so these are not a problem for me. What I am afraid of though, is blood. The sight of it makes me pale and dizzy. I'm not sure why, but that's that. And perhaps they can't also explain why they fear frogs. A quick search revealed that fear of frogs is called Ranidaphobia. There is even a method of treatment for this fear. This site has the slogan: "Imagine what your life would be like without fear of frogs". Ah, think of the possibilities! Oh, and Hemaphobia is the fear of blood. Hmmm... they also offer treatment for this phobia. Well, I don't see blood everyday anyways so I'm fine, thank you. By the way, they like Kermit the Frog of The Muppets. And I like dinuguan (blood stew; visit this recipe from The Radical Chef). Wierd, huh? May 1 is Labor Day in the Philippines, and is a non-working holiday. Labor Day is especially significant to the working sector because it is at this time that many organizations and activists hold protest rallies with the goal of bringing to attention such pressing issues as taxes, increasing utility and service charges, and wage adjustments. In the Northern region called Pangasinan, May 1 is also the Fiesta ng Dagat (Feast of the Sea), which is celebrated with boat races and a day of fun and sun. This is a Sunday, but a Presidential Decree has made May 2 also a non-working day. Personally, May 1 is a day where we get time off from work, and I usually spend such times at home. The searing midday sun is enough to make me stay put and play video games or watch TV. But this weekend was quite different. 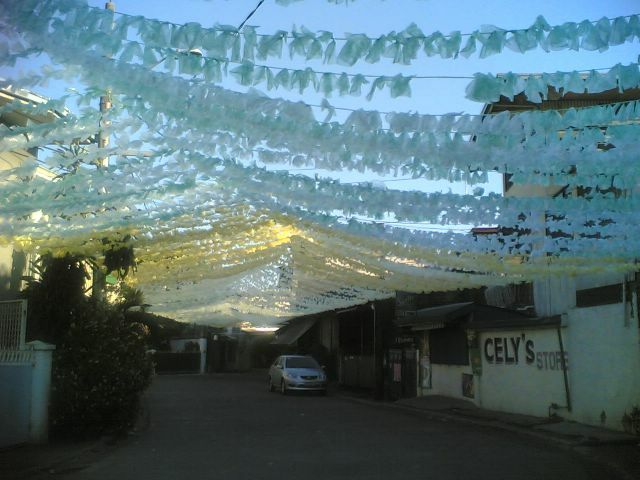 Our neighborhood has gotten into the fiesta habit, and has strung colorful whatchamacallits above the streets. Sorry I don't know what these are called (sheepish grin). Apparently there is a contest for the best and most colorful street, so there. The fiesta is next weekend. In my 7 years' stay in our place, this is the first time I've seen more than one street dress up for the occasion. There are also announcements for singing contests. Yup, that's Filipino for you. Singing is part of life, much like basketball. 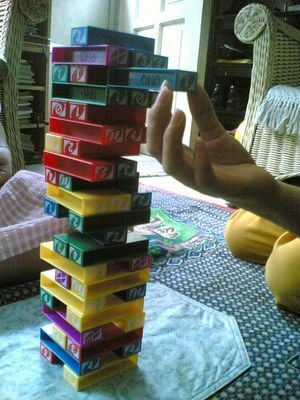 Then yesterday, we played Uno Stacko. It's a game which makes you pile blocks upon blocks until it collapses, with rules in the block sequence. It was fun; we played for a couple of hours, then proceeded to watch TV. It's too hot to move around much, so we simply had a laid-back afternoon and ate our halo-halo.